On January 22, 2019, Canada’s Food Guide was released, and featured a noticeable change in the way red meat was integrated when compared to past iterations. The Public and Stakeholder Engagement (PSE) team and other stakeholders continue to field interviews, and press releases from several organizations are scheduled to go out. Over 20 interviews were conducted by industry spokespeople across the country on the day of the launch. While there is some concerning language in the new Food Guide, the PSE team, along with other stakeholders, have determined that industry’s overall tone must remain positive and to highlight the benefits of beef consumption and the points of the food guide that industry supports. Beef fits as part of a healthy diet that also includes whole grains, dairy, fruits, vegetables and other plant foods. The goal is food synergy and supporting healthy eating habits. It is also extremely important that to keep Canada’s Food Guide and the EAT-Lancet report as separate issues, though media may try and lump them together. There is a speaking point in the key messages below to use if are asked this question. The speaking points below were created by the PSE team in coordination with Canada Beef, and can be used by anyone and shared freely. Additional resources are available at ThinkBeef.ca and the #BeefBelongs resource below. ThinkBeef.ca is a program supported by Canada’s import levy that focuses on the healthfulness of beef, and culinary skills of Canadians. Regional and other national stakeholder groups should feel free to respond to local inquires on their own, using the provided information. Anyone arranging an interview is encouraged to send a note to the PSE team with information on who did the interview, the location and the outlet. This will allow for additional tracking of media requests. Jill Harvie,the stakeholder engagement manager at Canadian Cattlemen's Association, joins us on the show to talk about the impact the new food guide will have on the beef industry. As Canadians, we are fortunate to have a wide range of protein options. Beef and other meats are among the most nutrient-rich quality protein sources available. We support Canada’s Food Guide in the visual plate model, with half the plate consisting of fruits and vegetables, one quarter devoted to proteins and one quarter to whole grains. Healthy diets consist of whole, nutrient-rich foods like meat, fish, dairy, whole grains, pulses, and fruits and vegetables. There is no reason to reduce or exclude beef (or meat) from a healthy diet. Beef is typically eaten as a complete meal, not an isolated food. Therefore, eating beef fosters the healthy meals and eating patterns that are recommended by Health Canada: dinners at the table, fewer ultraprocessed foods and cooking healthy meals as a family. Many Canadians are undernourished yet overfed. Dietary trends already show a decrease in meat and dairy consumption, while obesity and type-2 diabetes are on the rise. Not all proteins are created equal. A small amount of lean beef can provide high-quality, readily available protein and many other nutrients with relatively low calories. To get an equal amount of protein from plant sources could mean consuming higher volumes and more calories. The many essential nutrients found in beef include: high-quality, complete protein, all essential amino acids, readily available iron and zinc and others such as riboflavin, niacin, selenium and vitamins B6 and B12. In 2015, The Canadian Heart and Stroke Association concluded that there was no good evidence of harm from saturated fat. Therefore, healthy, whole foods that may also contain saturated fat need not be avoided. Red meat accounts for only 10% of the saturated fat in our diet, and half the fat in beef is the same healthy monounsaturated fat found in foods like avocados. Meats and plant-based foods are better together – the nutrient value of both foods increases when consumed as part of a meal. For example, the absorption of iron increases over 150% when meat and legumes are combined on the plate. All food production systems come with their own impacts and benefits. To replace Canadian beef with another protein source could in fact mean higher caloric and environmental impacts from other foods. 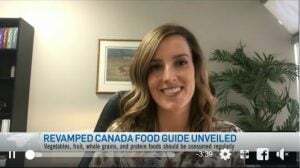 Canada’s Food Guide and the recently released EAT-Lancet Report are two entirely different documents with different motivations. The EAT-Lancet Report is a global document funded by foreign organizations and uses foreign data to draw its conclusions. Canada’s Food Guide is a Canadian-specific document that was developed by the Health Canada.